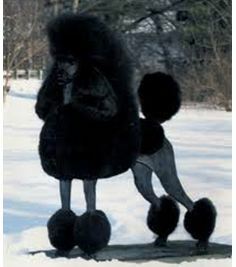 The poodle is believed to have originated in Germany in the 15th and 16th centuries where it was known as the Pudelhund. Pudel (cognate with the English word "puddle"), is derived from the Low German verb meaning "to splash about", and the word Hund in German means "dog" (cognate with "hound"). The breed was standardized in France (where the name "French Poodles" comes from), where it was commonly used as a water retriever. They come in 3 sizes. The largest, which is referred to as the Standard Poodle has a minimum height of 38 cm; the Miniature poodle between 28 and 38 cm and the Toy poodle should measure less than 28 cm. The Standard Poodle is the oldest of the three varieties, and was later bred down to the miniature and toy sizes. Despite the Standard Poodle's claim to greater age than the other varieties, some evidence shows the smaller types developed only a short time after the breed assumed the general type by which it is recognized today. The smallest, or Toy variety, was developed in England in the 18th century. The body looks square - ideally the back is as long as the height at shoulder. The tail is held aloft. The coat is dense and curly and can become waterlogged if not kept short, it can be either solid-colored or parti-colored coat and vary from white, black, brown, parti, silver, gray, silver beige, apricot, red, cream, sable and brindle. All three varieties are very similar in temperament, they are very active, intelligent and elegant dog that are trained with ease. Being active dogs they need to be kept occupied, as they get bored fairly easily and have been known to get creative about finding mischief or they may develop bad behaviour. The owner should start training from a very young age and also set boundaries and rules. Exercise is very important although not very demanding, but they will become high strung if you do not give them the proper amount and type of exercise. Daily walks should be sufficient but other activities such as agility, obedience, tracking, and even herding will keep them fit both physically as well as mentally. They will also enjoy a good romp in a safe, open area off lead such as a large, fenced-in yard and they adore water and love sessions of play. It is also very important, like with all dogs, to socialize them properly from a young age. They craves attention & love and bond very quickly to their owners, they are not the type of dog to live outside in a kennel, as they enjoy being with their owners and like to be included in family activities. Poodles tend to become agitated with a disruption in their routine and can be extremely sensitive to the goings on of a household. The Toy poodles tend to exemplify this more than the two larger varieties, becoming hyper-sensitive if not properly handled and cared for. These dogs also tend to have an acute sense of what is going on and will not hesitate to bark to alert their families of the possibility of danger. They are fearlessly and faithful to their families, making them good watchdogs. The Standard Poodle is proud, graceful, noble, good-natured, enjoyable and cheerful. This variety is generally lower energy and often calmer than the smaller varieties. They are sensitive to the tone of one's voice and will not listen if they sense that they are stronger minded than their owner, however they will also not respond well to harsh discipline. Owners need to be calm, yet possess an air of natural authority. They do need more space than the smaller varieties, so a house with a yard is preferable. They have also retains there sporting instincts, have great stamina, and need more activity than the smaller varieties. The Miniature Poodle is a joyful, playful companion dog. Smaller dogs can develop a complex called Small Dog Syndrome, this is where the dog believes he is the boss and is mainly due to the owner being too lenient with the dog. This can cause them to become sensitive, nervous, and not very trustworthy with children and possibly strangers, along with many other behaviour issues such as snapping, growling, guarding, demanding and obsessive barking. Because these dogs are so intelligent they are more likely to take chances with their owners and if the owner is not firm and there is a lack in human to canine communication, rules to follow and limits to what they are allowed to do they are prone to developing this complex. They don’t need a lot of space and are happy to live indoors (even in a flat or townhouse with a small garden) but love going out for walks. The Toy Poodle is highly responsive, sweet, cheerful, perky, lively, delightful, very amusing and keen. Unlike the larger varieties they may snap if they are teased or surprised and like the Miniature they are likely to develop the Small Dog Syndrome if they are not given rules to follow and limits as to what they are, and are not allowed to do. Like the Miniature they don’t need a lot of space and are happy to live indoors (even in a flat or townhouse with a small garden) but love going out for walks. Want a dog that is highly intelligent and easy to train, however you must be willing to put the time into properly training and keeping the dog entertained. The higher the dog’s intelligence the more mental stimulation they need. Have previous dog experience and will be able to firmly set the boundaries and rules. Which other breeds are most compatible with the Poodle? A well socialized Poodle will get along with most other dogs. The best choice would be dogs that are generally calm and not to in your face like Shi Tzus, Pekenese, Pugs, Boston Terriers, Chinese Crested and of course other Poodles. Breeds like e.g. the Chihuahua may irritate the Poodle because they tend to be all over the place. It is also best to avoid dogs that tend to have a strong dominant or challenging side like Rottweiler or German Shepherd. All three varieties generally get along well with other dogs and non-canine pets, however for this to happen they need to be well socialized with other animals. Also being so intelligent and biddable you can teach them to leave other pets, like rabbits, guinea pigs, and birds, alone. But don't forget that poodles are dogs and dogs are predators. So don't leave your poodle alone with loose fuzzy creatures as they could view them as prey. The Standard Poodles are generally friendly toward strangers, and are excellent with children. Whereas the smaller varieties are good with children but are recommended for older children as they may become snappy if they are handled roughly by a young child that think they are toys. It is also recommended that very young children not be left unsupervised with them and to be shown to handle the dog gently. Poodles may become shy or anxious around strangers if they are not properly socialized. Poodles are extremely intelligent, they are very easy to train and housebreaking them is a breeze. They love learning new tricks to show off and crave stability and routine. Training is a must with this breed as it stimulates them mentally as well as lets them know there place within the household. At the very least you should train them to heel, come when called, sit, and stay. Unlike most dogs which have double coats, poodles have a single layer coat (no undercoat) composed of dense, curly fur that sheds minimally. They could be considered hypoallergenic (though not completely allergen free). The little that they do shed does not come off the dog, it becomes tangled in the surrounding hair and this can lead to matting without proper care. Show dogs need to be cut by an expert as a standard is laid down as to how the poodle is to be cut. This requires many hours of brushing and care per week, about 10 hours/week for a Standard Poodle. A pet just needs regular grooming and trimming to keep the coat tidy about every six to eight weeks. Pet clips are much less elaborate than show and require much less maintenance. This can be done professionally but is easy enough home with the proper equipment and knowledge. Other grooming requirements is to clean and check the ears frequently and the teeth need regular scaling. Poodles are a long-lived breed. They are, nevertheless, subject to many genetic diseases such as runny eyes, cataracts, progressive retinal atrophy (PRA) which may cause blindness, IMHA (Immune Mediated Hemolytic Anemia), heart disease, diabetes, epilepsy, hip dysplasia, ear infections and bloat, so it is wise to feed your Standard 2-3 small meals a day, rather than one large one. Allergies and skin conditions are common, possibly due to unskilled use of clippers or allergies to shampoo and/or color reinforces. Brown Poodles tend to become prematurely gray. On average Poodles live for 12 to 15 years, with the smaller varieties having a longer lifespan than the Standard size. In its natural state, the coat forms cords (ringlets like dreadlocks) and these take a long time to dry after a swim. The Miniature Poodles are very comical and intelligent and can be taught tricks. They were used as circus dogs in France. Keep them mentally fit with training and activities. Poodles thrive on consistency, so try to keep the routine the same from day to day. Poodles who are constantly trying to second guess a chaotic household may become anxious, nippy, and high strung. Give them regular exercise (regular walks and opportunities to run and play off the leash in a safe area) as this will keep them fit and in good spirits. Socialize them properly from a young age. Get this dog if you want a backyard dog that is not allowed in the house. Get this dog as a first time pet owner, they need someone that knows what they are doing otherwise they can become very difficult to handle. Leave them alone for long periods of time.